The Town of Oro Valley (map), incorporated in April, 1974, is a glorious community on the edges of Tucson’s northern border. Residents and visitors are constantly amazed at the spectacular mountain views provided by the majestic Catalina Mountains to the east and the stately Tortolita Mountains to the north. Oro Valley sits at an elevation of 2,620 feet, covers over 34 square miles, and has a current population of nearly 40,000. The area of Oro Valley has been inhabited intermittently for approximately two thousand years by various groups of people. The Native American Hohokam tribe lived in the Honeybee Village located in the foothills of the Tortolita Mountains on Oro Valley's far north side around 500 AD. Oro Valley residents vigorously support an active arts scene and community. The Greater Oro Valley Arts Council (GOVAC) promotes artistic endeavors which can be evidenced throughout the town by numerous public art exhibits and displays. In fact, the Town requires all commercial and industrial developments to commit 1% of their construction costs to public art pieces that must be viewable to the public at least 40 hours per week. GOVAC regularly hosts public concerts, art shows, and cultural galas throughout the year. 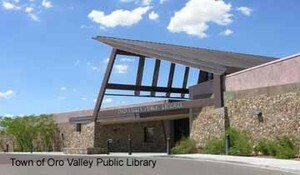 There are five excellent public schools in Oro Valley: Canyon Del Oro and http://www.amphi.com/~irhs/index.html with grades 9-12; Wilson School with grades K-8; Painted Sky Elementary in Rancho Vistoso with grades K-6 and Copper Creek Elementary, also with grades K-6. Other area schools are Mesa Verde or Harelson Elementary Schools and Cross Middle School. These schools are part of the outstanding Amphitheater Public School District. Institutes of higher learning include nearby Pima Community College, with an enrollment of more than 23,000, and the University of Arizona in central Tucson, with an enrollment of 30,000. Oro Valley currently has a strong network of roads suitable for biking, an activity the community holds dear. Throughout the next several years, cyclists will see Oro Valley’s Bikeways Plan come to life and the inventory of bikeable roads double. To further enhance bicycle riding, the Town is planning to construct 7 miles of separated paths along the CDO Wash and Big Wash which will link up with the Pima County bikeway paths. When the entire system is complete, there will be over 100 miles of pathway along the county washes for riding, walking, jogging and inline skating. The incredible growth and development experienced by the Town of Oro Valley has created a viable environment for commerce while increasing the quality of life for its residents. Northern Pima County is the second fastest growing sector in the state of Arizona, and small business is the primary driver.